Some Holiday Homework For You….. Here are some great stretches that you can try in the holidays to keep you strong and supple. Here are two great links for you to learn from. Lie on your tummy, like the students in the picture and try and get your hips and feet on the floor. Hold onto a chair and do slow rises 10 on two feet and then work up to 10 on one foot. Don’t push on the chair. Sit and watch TV with your legs open and your elbows on the floor. Sit with legs straight in front of you, flex your feet and try and touch your toes. Do thirty sautes and concentrate on using your feet to push off the floor and stretch fully in the air. Practice all your splits and hold. Do this only when you are warm. Every dancer’s body is different. Some dancers are less flexible. Dancers with “tight” bodies are built for stability, with dense connective tissues. Their muscles are less extensible. Conversely, some dancers are innately more flexible. The hyper-mobile physique has an increased risk of injury as they have a larger joint range of motion, but they are also more vulnerable to serious ligament sprains. Hence “loose” dancers should spend less time stretching than “tight” dancers. Loose dancers should spend that time on strengthening exercises instead. It is important to avoid comparing the flexibility of one dancer with that of other dancers. 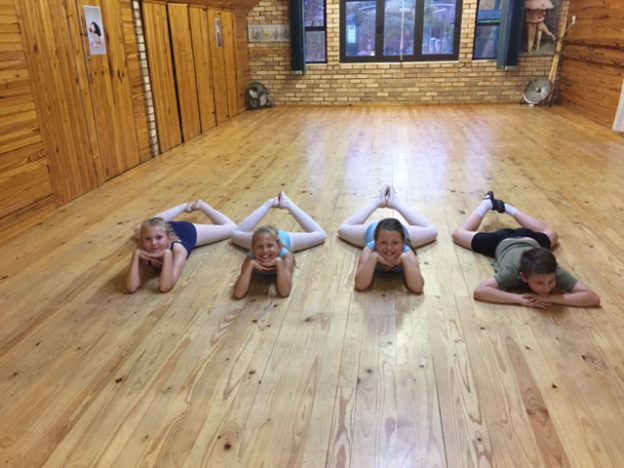 Instead, work on what each individual dancer needs – strengthening and stabilising exercise for the loose dancer, stretching/flexibility for the tight dancer. When stretching, it is vital to not push the body too hard. Pushing stretches too hard may cause a muscle strain (tear), so is important to be cautious. Stretches should be held to a point of mild discomfort, not pain. Holding a static stretch for 30 seconds is enough to maintain joint range of motion and current flexibility. Typically, each stretch is repeated 3 to 5 times in a single stretching bout. But, if increasing flexibility is the goal, then deformation of the connective tissue is necessary to produce permanent muscle length change. When trying to increase flexibility, it is important to employ stretching AFTER dancing or other activity when muscles and connective tissues are warm. Try to do some stretching every day. 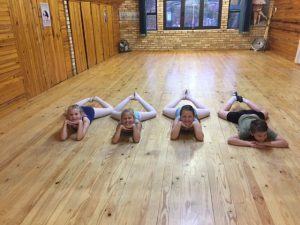 This entry was posted in How To... and tagged Stretching on December 18, 2016 by admin. Here is a great video for those of you who want to know how to do your daughters hair, or even your own. This entry was posted in How To... and tagged How To Make A Ballet Bun on January 15, 2016 by admin.